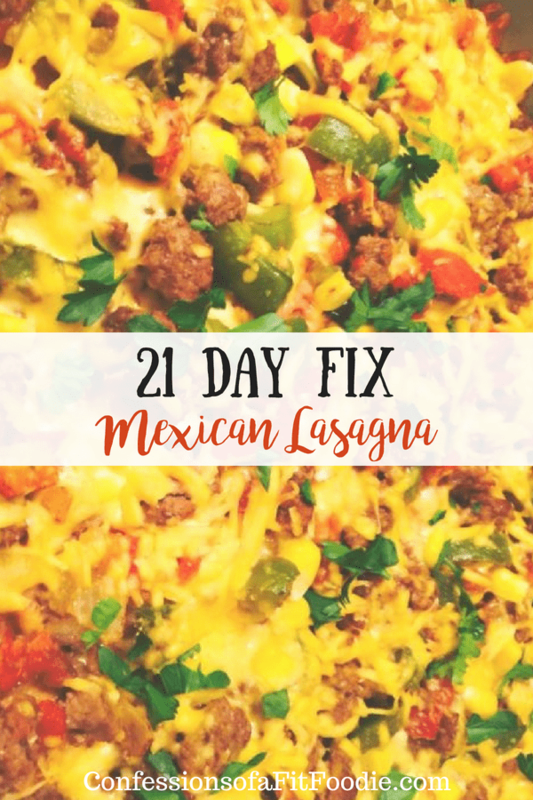 This 21 Day Fix Mexican Lasagna is one of my family’s all time favorite meals! And it makes great leftovers for lunch, too! 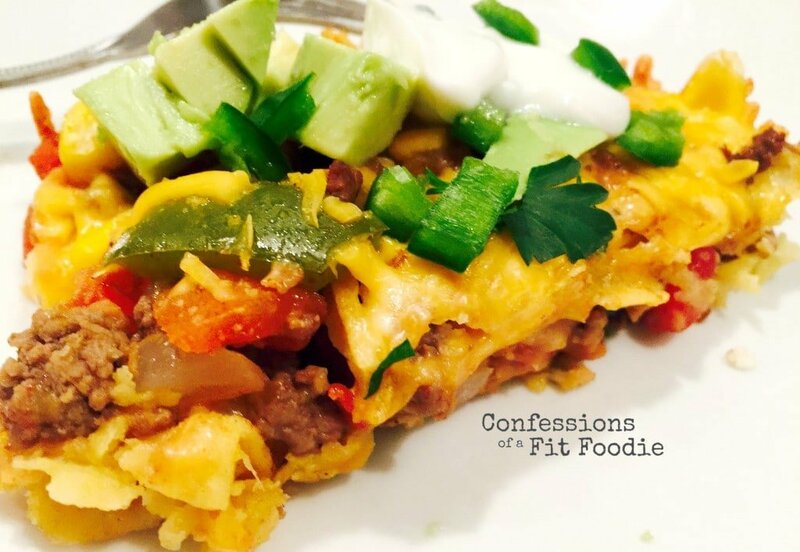 Confession #67 – There’s something about snowstorms that make me hungry. Oh – and they also make me drink a lot of wine. In other words, I might be slightly over my yellow count after this weekend’s blizzard. And that’s why recipes like this one are SO important. 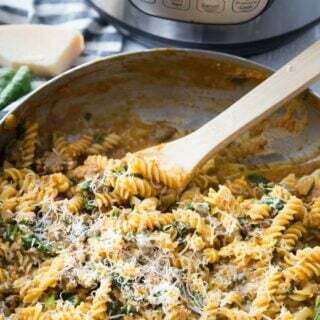 Cheesy, delicious comfort food that is only ONE yellow. 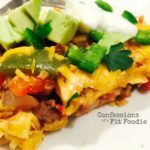 In my current challenge group (which is totally amazing, by the way), this Mexican Lasagna recipe is all the rage. And what better time to try it than during a blizzard? Except when I looked at the recipe, the container count seemed off…and there was definitely more than ONE yellow there. I thought about just recalculating the recipe and making it as is…but then I poured another glass of wine and realized I need to do something. So I fixed it. 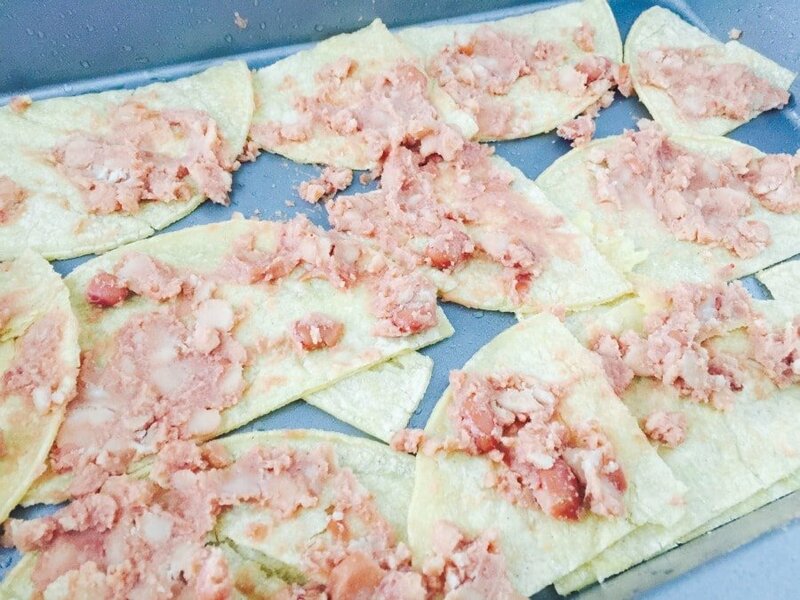 I cut out some of the tortillas and used less refried beans, hoping that it wouldn’t change much of the overall taste. I even squeezed in some corn for color. 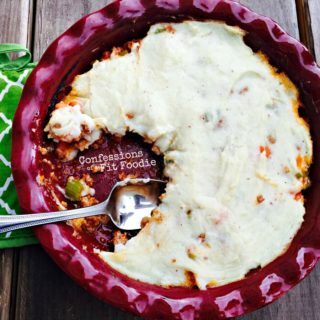 I haven’t had the original, but my true ONE yellow version of this Mexican Lasagna was absolutely delicious and the perfect meal after shoveling 30+ inches of snow from the driveway. I also kept it to less than a full blue…because, really, this needs to be topped with avocado. Trust me. And some fresh cilantro, jalapeno, and cilantro lime yogurt sauce doesn’t hurt, either! 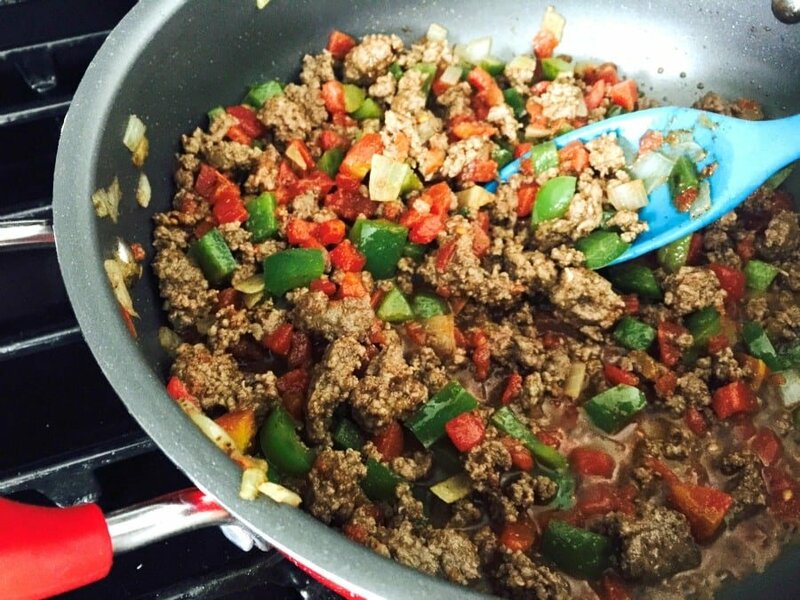 Brown your ground meat in the skillet until cooked through. 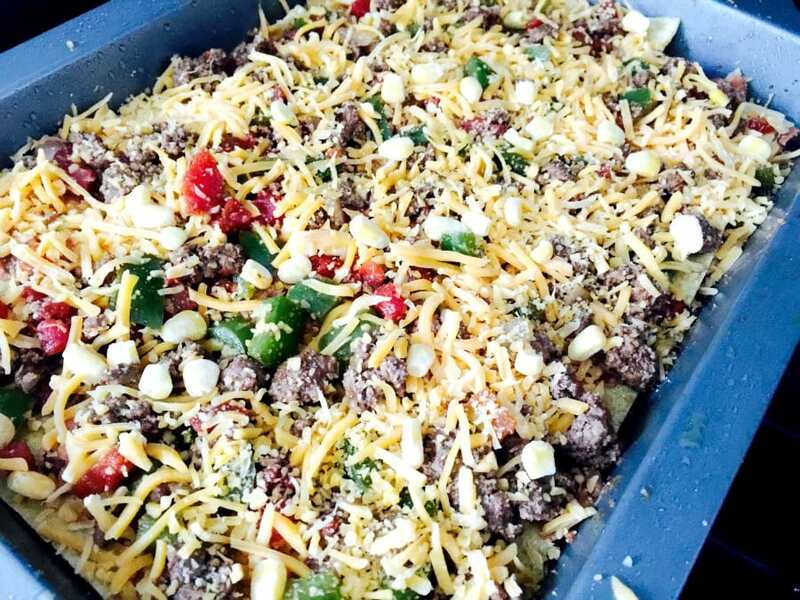 Add Rotel, cooked onions and peppers, corn, and southwest seasoning to the meat. Simmer for a few minutes. Spray the bottom of a 9×13 pan with cooking spray. Line the bottom of the pan with 8 tortilla halves and spray tortillas with a bit more cooking spray. Then spread with half of the refried beans, then layer 1/2 of the meat and vegetable mixture over top. Layer the remaining 8 tortilla halves on top of the meat mixture and repeat the directions above. Sprinkle the shredded cheese evenly over the top. Top with diced jalapenos, fresh cilantro, avocado, and some cilantro line yogurt sauce and enjoy! Yum! I must make this! I’m thinking of spritzing with the cilantro and roasted onion olive oil. Thank you for sharing! LOVE that idea! I need to restock on my Bodacious oils!! I’m looking for a cauliflower pizza crust recipe that you can hold and eat like pizza. I’ve tried 2 different ones that didn’t really turn out. any suggestions? Hey! I feel your pain…I haven’t gotten this quite right, either. And I don’t post any recipe unless it’s pretty near perfect, lol. I’ll keep looking and working on this :). 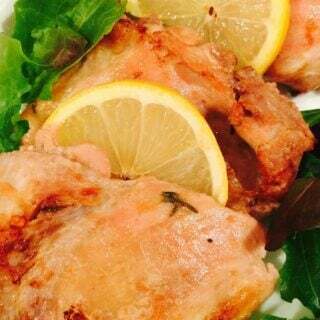 I love every recipe you have. Made this tonight – and no surprise -it was delicious!! What I love about your recipes is that they are family-friendly. My kids and husband enjoy them just as much as I do! SO awesome!! This is the ultimate compliment, lol! 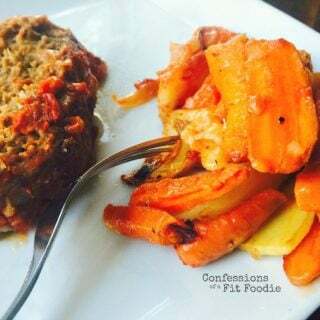 Healthy recipes fit for a FAMILY! Thank you so much! Hi, how did you measure out your portion? Did you actually fill up 1 yellow, 1 green, 2/3 red? I never know how to figure the portion sizes on recipes when they are all mixed together. I actually measure everything while I am cooking, and then do some quick math to figure it out…so in this case, you should divide your pan into six equal portions. Does that make sense? I would love it if you started sharing any “math” you do to calculate poriton sizes. I’m never sure how many servings your recipes make. Is there a recipe for the cilantro yogurt sauce? I have made a similar sauce with greek yogurt, fresh lime juice, a little garlic and sriracha. I didnt add cilantro, but you totally could. 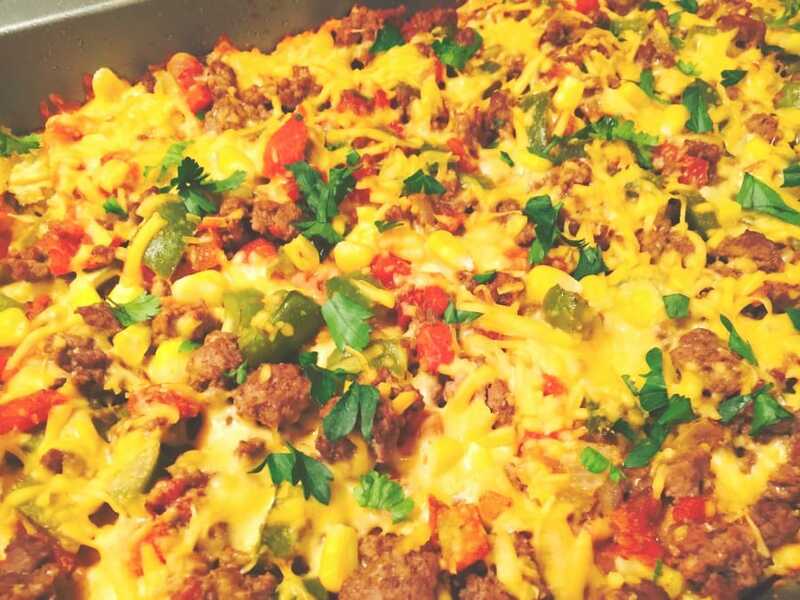 Mexican Lasagna in picture looks like more tortilla than 8 halfs. Hi Elaine – it’s 8 tortillas, cut in half. So 16 halves. Also – here is the yogurt recipe! Mix plain Greek yogurt with a tsp of cumin, chopped cilantro, and the juice of one lime. And that’s it! How much Greek yogurt? 1 cup? 1 red container? I would do 1/3 cup to make it a perfect 1 RED serving. Could you freeze this? I’m guessing just bake longer, but wondering if you’ve ever done it. Thanks! Yes! It freezes well – prepare, but don’t bake before freezing! Then, yes – it might take a little longer to bake, but not much. I made this last night and it was amazing! Definitely a new favorite for the rotation. Thanks! Yay!! Thank you so much, Jessica!! Made this tonight. Absolutely fantastic. I am a bit confused on the container count though.. how do you figure this is only 1 yellow? I am not good at this 21 day fix stuff unless i keep it plain Jane which I’m am over , so i am trying to figure it all out. Thanks for any input. Hi! So if you add up all the yellows – 4 yellow for the tortillas, and 2 yellows for the beans/corn, you get 6 yellow. And if you divide that by 6 servings, you get 1 yellow per serving! Yay!